Barack Obama and his wife Michelle are living it up on their Italian vacation, looking utterly relaxed while enjoying the country’s famous cuisine. The former First Lady modeled a colorful caftan that fell off her shoulder and flat sandals as she and her husband had drinks and a fancy lunch on Monday at Borgo Finocchietto, the stunning Tuscan villa where they are staying during their trip to Siena. While Michelle showed of her chic vacation style, Barack looked comfortable in a gray polo shirt, leaving the collar unbuttoned. The pair, who arrived in Italy Friday on a private plane escorted by six fighter jets and a 13-car motorcade, had a police car waiting for them in the streets of Siena on Monday, and a siren could be heard as they made their way outside. While Barack waved at the crowd and smiled at his adoring supporters, Michelle briefly saluted the fans, then kept her head demurely bowed, adopting a more reserved attitude than the outgoing demeanor she typically displayed as First Lady. The couple appeared to be stepping out of the Duomo di Siena — the Siena Cathedral — a stunning medieval building dating back to the twelfth century. But the couple has not restricted themselves to historical sites as far as enjoying all that the country has to offer. Earlier in the day, Barack was spotted heading out on a bike ride with at least two of his security team. Keeping his Secret Service agents active, the former president raced them to the top of an Italian hill, and rode down with them in formation. The former First Lady was later seen tucking into some Italian gelato before she climbed into her waiting car. Meanwhile, Barack hit the Castiglion del Bosco golf course — Italy’s only private golf club set within a UNESCO World Heritage Site. He seemed to relish getting behind the wheel of the golf cart, something he wasn’t allowed to do while he was in the White House as presidents are not allowed to drive. Membership to the club is by invitation only and the course was designed by Tom Weiskopf, a former professional golfer. Italian state and armed police, the Polizia di Stato and the Carabinieri, helped keep the 18-hole course secure while the former president played. Barack and Michelle began their vacation on Friday, when they touched down at Grosseto Air Base in Tuscany, their private jet accompanied by six Eurofighter Fourth Wing jets. Adding to their carbon footprint, the couple was then whisked away in an armored Chevrolet as part of a 13-car motorcade, transporting them to their incredible Tuscan villa, Borgo Finocchietto, as many Italians lined the streets to wave them as they passed. 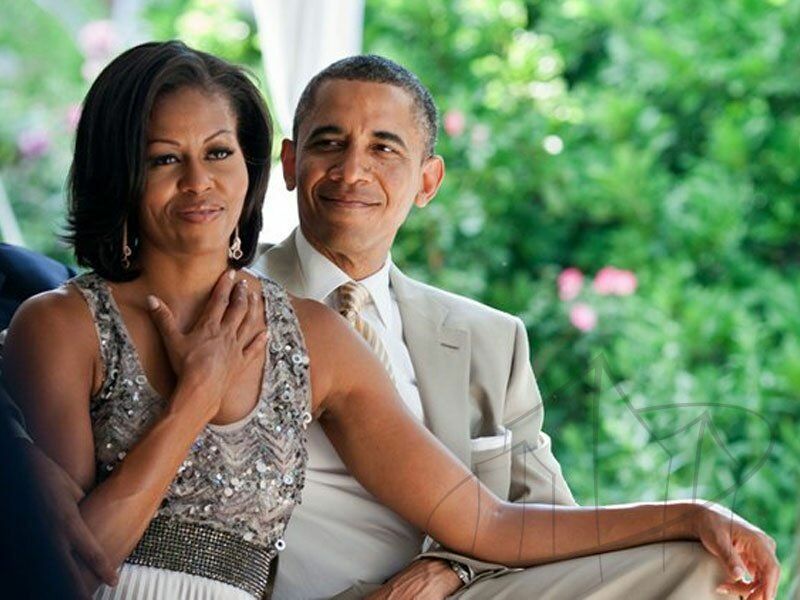 Michelle and Barack have Borgo Finocchietto to themselves during their five-night stay — at an eye-watering cost of $15,000 per night. Not that the couple is likely to have paid, as the villa is owned by the ex-president’s former ambassador to Italy, John Philips. The family will be ensured privacy at their villa, which is a kilometer away from prying eyes on the road. Italian authorities have even imposed a ban on wild boar hunting, just in case the former president is accidentally shot. They are expected to fly out on May 24. The Obamas, who have been on multiple vacations since leaving the White House in January, will also reportedly visit Florence during their trip. Resting on more than six acres of rolling hillside near Buonconvento, 45 miles south of Florence, the village of Borgo Finocchietto provides superb views of the surrounding countryside – but what’s inside the villa and its attached homes is just as stunning. According to its official website, Borgo Finocchieto — its name translates as ‘village of fennel fields’ — has 22 bedrooms across its five buildings. The largest of those rooms is a colossal 800sqft ‘Medici’ master bedroom with its own steam room, Jacuzzi and sauna. As well as the smaller dining spaces in the villas, there are two full-scale dining rooms that seat a total of up to 44 people, as well as outdoor dining spaces, a wine-tasting room and a wet bar. There are also courts for fans of tennis, basketball and the Italian bowling game bocce, as well as a group spa, sauna and steam room, a swimming pool, and a gym and fitness center. And visitors are cared for by a staff of 19, including a concierge, executive chef, wait staff, bartender and housekeepers. Special requests can also be made to explore the surrounding countryside on horseback, by car or scooter, or even using helicopters and hot air balloons. It’s a countryside worth exploring: The verdant green fields — dotted here and there with trees and hedges, rising up into distant mountains — are beautiful enough, and have been largely unchanged for 1,000 years. But there are also other stunning locations to explore just a short drive away, from the winding cobbled streets of Buonconvento just over a mile away to a collection of castles, mansions and other villages a short car journey away. All of this has been made open to the Obamas, who traveled from Milan, 197 miles northwest of the village, over the weekend. Borgo Finocchietto first appeared on maps in Italy in 1318, when it was built by the noble Borghese family, whose members included Pope Paul V.
The fields surrounding the five-building village were farmed by peasants and sharecroppers, and by 1960 it had become home to 21 families, according to a 2007 report by The New York Times. But it had also become run-down, with the chapel being used as a barn and livestock being kept on the ground floor of a manor house. So in 2001, Philips — who made a small fortune as a public rights lawyer, and served as ambassador to Italy under Obama from 2014-2017 — bought it up and started reconstructing it 30,000 square feet of buildings. That proved to be an even bigger task than it sounds. ‘Rebuilding was expected to be totally consistent with what was there before,’ Phillips told the New York Times. Thankfully, Italy has documentation on many buildings dating back centuries that details the dimensions — and sometimes even materials — of buildings. And while the exteriors could not be changed, the interiors were allowed amendment — which meant that the chapel-turned-barn could be transformed into the four-bedroom Santa Teresa suite. Materials for both the exterior and interior were also sourced from within the country, ensuring that, despite its new American owner, it would remain unmistakably Italian. According to La Cure villas, visitors can rent out nine bedrooms in the main house for $7,000 per night, or all 22 bedrooms – across all five buildings – for $15,200 per night. There is a minimum three-night reservation. Obama traveled to Italy last week to speak at the ‘Seeds & Chips – Global Food Innovation’ summit. There, he talked about climate change and made a pointed remark about Trump, saying people ‘get the politicians [they] deserve’ when they don’t vote. He was joined by Michelle, who on Friday spoke at the summit for the Partnership for a Healthier America in Washington, DC. She also took Trump to task, asking why his administration canceled her project to provide schools with healthier meals. ‘You have to stop and think, “Why don’t you want our kids to have good food at school? What is wrong with you, and why is that a partisan issue?”‘ she said.